Julie Krupnick deflects a shot. The sophomore will be competing for the starting spot in the net. Coach Kelly Amonte Hiller is a nine-time NCAA Champion, five-time IWLCA National Coach of the Year, two-time NCAA National Player of the Year and a U.S Lacrosse Hall of Fame Inductee, among many other accolades. Those awards bring a level of deference from opposing teams — and her own. However, they also come along with some self-afflicted scrutiny. No. 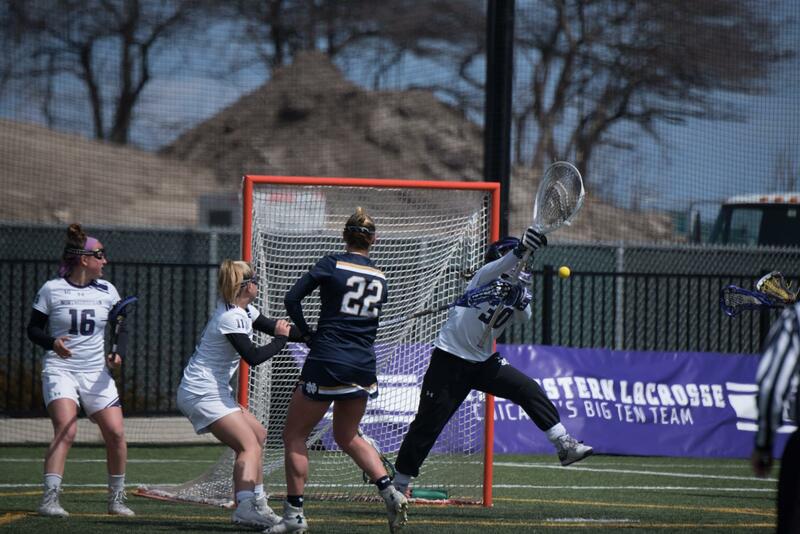 7 Northwestern, who exited the 2018 tournament with a 19-14 loss to UNC in the quarterfinal, starts off its season Friday with an exhibition game against No. 18 Colorado before playing its regular-season opener against Louisville on Feb. 8. The Wildcats return with only half of last year’s starters from last season’s quarterfinal run. Among the holdovers are redshirt sophomore goalkeeper Julie Krupnick and senior attacker Selena Lasota, who was identified by Krupnick as a stabilizing presence on this year’s team. Lasota led Northwestern with 75 goals last season and started all 21 games as a stalwart member of NU’s front line. While the Cats averaged nearly 16 goals per game last season, Lasota will be forced to step into a bigger role following the departure of midfielder Sheila Nesselbush. While there will be additional changes in the starting lineup to accommodate the team’s losses after last season, the goalkeeping competition will continue from last year. Krupnick started off last season strong but was later forced to split time with senior Mallory Weisse due to a tactical change. It remains to be seen which goalkeeper will get the nod against the Buffaloes, but Krupnick acknowledged her teammate provides a good substitute in certain situations. Krupnick said she is optimistic about the upcoming season, echoing her coach’s attitude. After NU wasn’t able to live up to its high standards last season, Krupnick said this year the Cats could make incremental improvements off the 2018 campaign. An important key in doing that, Amonte Hiller said, will be matching the intensity typically found in high-performing teams.